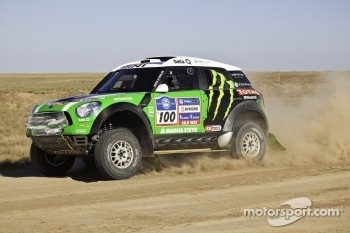 Polish driver Krzysztof Holowczyc has taken one more step to consolidate his lead in the Dakar Series Silk Way Rally. His team mate Stéphane Peterhansel was once again stranded, this time in the sand. All he could do was to reverse but he didn't notice a bunch of camel grass and the wheels of his MINI All4 Racing lost the contact with the ground. Peterhansel and his co-driver Jean-Paul Cottret had to use the spare wheel to support the jack to be able to escape and they lost seven valuable minutes that actually meant the victory for Holowcyzc in the third stage. The gap between him and Peterhansel was only 1 minute 46 seconds. Alexander Mironenko in the third X-Raid car completed the virtual podium of the day for the Trebur team but he finished almost half an hour behind his team mates. Behind the X-Raid cars, it was the turn of two wheel drive buggies with Ronan Chabot finishing fourth and Stéphane Henrard fifth. Leader of the category with the brand new Oryx buggy, Christian Lavieille, made many mistakes in navigation today and lost third place on the stage. 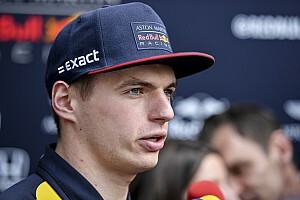 Among the trucks, Kamaz seems to have "agreed" to share the partial victories among their drivers. Today it was the turn of Ayrat Mardeev but the young Russian was closely followed by the brand new Tatra of Ales Loprais. The Czech driver led the stage until he made a navigational mistake which cost him more than 25 minutes. At the end of the day Firdaus Kabirov clocked the second best time ahead of Hans Stacey. The second Iveco, driven by Jo Adua, finished ninth after having broken a spring. 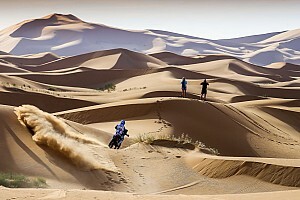 “The stage was very difficult with a really bumpy track. Most of the time we were bouncing around and although we noticed that something was wrong with the rear suspension we managed to finish the stage without having to stop to repair. Now we have to replace the broken part and make some adjustment to the Donerre's shocks because we can expect the same kind of track tomorrow on the Astrakhan - Astrakhan loop,” commented co-driver Ferran Marco.